Dr Moore is a Paediatric Oncologist and Director, Clinical & Biomedical Research at Children's Health Queensland Hospital & Health Service (CHQ). 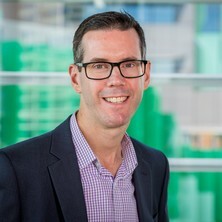 He is also Group Leader of the Childhood Leukaemia Research Laboratory at the University of Queensland Diamantina Institute, TRI, and Director of the Queensland Children's Tumour Bank housed in the Centre for Children’s Health Research at CHQ. The Queensland Children's Tumour Bank is a unique resource, facilitating local, national and international collaborative research across all childhood cancer types. Dr Moore's clinical and research interests are on acute myeloid leukaemia (AML), an aggressive form of leukaemia with a poor prognosis. His research focuses on clinical trials for childhood AML, and novel molecular methods of monitoring minimal residual disease (MRD). Population pharmacokinetic modelling of doxorubicin and doxorubicinol in children with cancer: is there a relationship with cardiac troponin profiles? EphA2 Is a Therapy Target in EphA2-Positive Leukemias but Is Not Essential for Normal Hematopoiesis or Leukemia. The outcomes and treatment burden of childhood acute myeloid leukaemia in Australia, 1997-2008: A report from the Australian Paediatric Cancer Registry. Vincristine: Can its therapeutic index be enhanced? Moore, A.S., Shaw, P.J., Hallahan, A.R., Carter, T, Kilo, T, Nivison-Smith, I, O'Brien, T.A., Tapp, H, Teague, L, Wilson, S.R. and Tiedemann, K (2009) Haemopoietic stem cell transplantation for children in Australia and New Zealand, 1998-2006: a report on behalf of the Australasian Bone Marrow Transplant Recipient Registry and the Australian and New Zealand Children's Haematology Oncology Group. Medical Journal of Australia, 190 3: 121-125. Clarke, M. T., Jones, D., Carvalho, D. M., Mackay, A., Izquierdo, E., Hargrave, D., Moore, A. S., Popov, S., Jacques, T. S. and Jones, C. (2018). The Molecular Pathology of Infant Gliomas. In: Winter Meeting on Epigenetics - Understanding Disease and Guiding Therapies / Joint Meeting of the Royal-Society-of-Medicine / 209th Scientific Meeting of the Pathological-Society-of-Great-Britain-and-Ireland, Marylebone England, (S4-S4). 25-26 January 2018. Clarke, M., Jones, D. T. W., Carvalho, D., Mackay, A., Izquierdo, E., Hargrave, D., Moore, A. S., Popov, S., Jacques, T. and Jones, C. (2018). The molecular pathology of infant gliomas. In: 119th Meeting of the British-Neuropathological-Society (BNS) / Epilepsy Neuropathology Symposium, London England, (20-21). Feb 28-Mar 02 2018. A pilot study to investigate the relationship between doxorubicin and doxorubicinol pharmacokinetics and cardiotoxicity in children and adolescents with cancer. Hennig, S., Kunarajah, K., Norris, R., Lobb, M., Charles, B., Pinkerton, R. and Moore, A. S. (2016). A pilot study to investigate the relationship between doxorubicin and doxorubicinol pharmacokinetics and cardiotoxicity in children and adolescents with cancer.. In: World Conference of Pharmacometrics, Brisbane / Brisbane Convention Centre, (). 21-24 August 2016. Hahn, Christopher N., Babic, Milena, Schreiber, Andreas W., Kutyna, Monika M., Wee, L. Amilia, Brown, Anna L., Perugini, Michelle, Singhal, Deepak, Hiwase, Smita, Feng, Jinghua, Parker, Wendy T., Moore, Sarah, Bardy, Peter G., Saal, Russell, Marlton, Paula, Moore, Andrew S., Gonda, Thomas J., Leo, Paul, Branford, Susan, DAndrea, Richard J., Lewis, Ian D., Bik, Luen, Scott, Harnish S. and Hiwase, Devendra (2015). Rare and Common Germline Variants Contribute to Occurrence of Myelodysplastic Syndrome. In: 57th Annual Meeting of the American-Society-of-Hematology, Orlando, FL, United States, (). 5-8 December 2015. Bruedigam, Claudia, Bagger, Frederik Otzen, Heidel, Florian H., Kuhn, Catherine, Guignes, Solene, Song, Axia, Austin, Rebecca, Vu, Therese, Lee, Erwin M., Moore, Andrew S., Lock, Richard B., Bullinger, Lars, Hill, Geoff R. and Lane, Steven W. (2014). Inhibition of Telomerase with Imetelstat Is Detrimental to Leukemia Stem Cells in Acute Myeloid Leukemia (AML). In: Abstracts - 56th Annual Meeting of the American Society of Hematology. 56th Annual Meeting of the American Society of Hematology, San Francisco CA, United States, (). 06-09 December 2014. Moore, AS, Faisal, A, Bavetsias, V, de Castro, DG, Sun, CB, Atrash, B, Valenti, M, Brandon, AD, Avery, S, Pearson, ADJ, Workman, P, Blagg, J, Raynaud, FI, Eccles, SA and Linardopoulos, S (2011). Resistance to Selective FLT3 Inhibitors, Driven by FLT3 Ligand and FLT3 Point Mutations, Can Be Overcome with the Dual FLT3-Aurora Kinase Inhibitor CCT241736. In: BLOOD. 53rd Annual Meeting and Exposition of the American-Society-of-Hematology (ASH), San Diego CA, (1490-1490). DEC 10-13, 2011. Adaptation and Validation of the Plasma Inhibitory Activity (PIA) Assay to Detect Inhibition of Aurora, ABL and FLT3 kinases by AT9283 In Children and Adolescents with Leukaemia. Podesta, JE, Griffin, MJ, Sugar, R, Squires, MS, Boddy, A, Linardopoulos, S, Pearson, ADJ and Moore, AS (2010). Adaptation and Validation of the Plasma Inhibitory Activity (PIA) Assay to Detect Inhibition of Aurora, ABL and FLT3 kinases by AT9283 In Children and Adolescents with Leukaemia.. In: BLOOD. 52nd Annual Meeting of the American-Society-of-Hematology (ASH), Orlando FL, (759-759). DEC 04-07, 2010. Moore, AS, Faisal, A, Bavetsias, V, Sun, CB, Atrash, B, Valenti, M, Brandon, AD, Avery, S, Raynaud, FI, Workman, P, Pearson, ADJ, Blagg, J, Eccles, SA and Linardopoulos, S (2010). Dual Inhibition of Aurora and FLT3 Kinases by CCT137690: A Novel Treatment Strategy Against FLT3-ITD Positive AML In Vitro and In Vivo. In: BLOOD. 52nd Annual Meeting of the American-Society-of-Hematology (ASH), Orlando FL, (1347-1348). DEC 04-07, 2010. Does myelosuppression during consolidation or high-dose methotrexate clearance correlate with tolerance of initial maintenance therapy in childhood acute lymphoblastic leukaemia? The impact of re-induction chemotherapy and minimal residual disease on allogeneic haematopoietic stem cell transplantation outcomes for children with acute myeloid leukaemia in second remission. Note for students: Dr Andy Moore is not currently available to take on new students.